Honda: Is Japan losing faith in the UK? There is rarely a single reason why a company takes a very significant decision. Many will be quick to pin the blame for Honda's decision to close its Swindon plant solely on Brexit, but there are other forces at work. A new trade deal between the EU and Japan will see tariffs on cars exported from Japan to Europe reduced to zero over time. That means a dwindling rationale to base manufacturing inside the EU, and indeed, Honda plans to move production back to Japan rather than relocate elsewhere in Europe. Production at Swindon has been in decline for some time and is currently running at about half its capacity - another strike against it. But having said all that, Japanese companies are very long-term investors. In the mid-1980s, Margaret Thatcher championed the UK as the perfect outpost for Japanese carmakers looking for access to European markets. It worked. 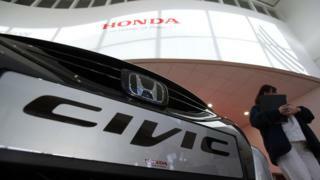 Honda, along with Toyota and Nissan, poured tens of billions of pounds into reviving the UK car industry. Since the referendum, the Japanese government, its UK ambassador and company managements have repeatedly warned about the corrosive effect of Brexit uncertainty and the possibility of losing frictionless trade with the EU. Honda is not alone in pulling investment from the UK. Nissan reversed its decision to build the X-Trail SUV in Sunderland, while Sony and Panasonic moved their European HQs to the EU. In each case, the rationale was slightly different, but many in Japan feel that failure to provide Brexit certainty counts as a broken promise, permitting the loosening of ties that used to bind the two countries.